This is basically just a pure action movie, but it does have a considerable arty panache, by action standards. Wesley Snipes plays a half-vampire who battles Communism by killing other vampires. He also acted as a producer and created some of the fight choreography. Unfortunately, the fighting puts an emphasis on Hong Kong style instead of on realism — and in a movie like this, the fights are pretty nearly the whole point of the film. The story contains nothing whatever that is original, but at least it’s solidly and stylishly put together. There is some good acting among supporting characters, including Stephen Dorff as the bad guy. 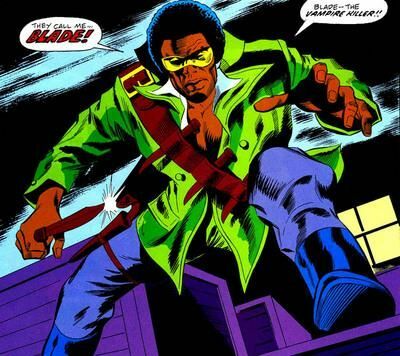 Getting Kris Kristofferson to play Blade’s mentor was definitely a win. But then, the cast also includes Traci Lords. 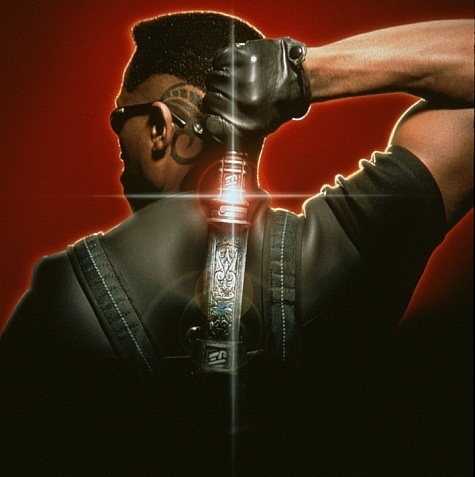 Wesley Snipes’ performance pretty much defines the Blade character for all future reference... according to some, the original comic was much more poorly written than this movie, and basically isn’t relevant any more. Director Stephen Norrington went on to helm The League of Extraordinary Gentlemen, a more ambitious but far sloppier piece of work than this. In between he made The Last Minute, which I have not seen but is said to be quite original. So this is, in many ways, nothing special. And yet... You know how, when you look back at the history of styles and trends and artistic innovations, it’s always possible in hindsight to point to something that anticipated the future, though nobody knew it at the time? You can always find, for instance, punk bands that existed before the word “punk” was used for them. Well, this movie anticipates the future of superhero films. I divide the history of super-cinema into four epochs. First came the Serial Era, before 1960. During this period, weekly serials were the only format for caped crime-fighters onscreen. Then in the sixties, after a gap of several years where no comic book movies were made at all, came the Camp Era. This ended in 1977, when the success of Star Wars launched the Dumb Blockbuster Era. In this period, comic book movies got a lot bigger and more serious, but they almost always retained a significant element of secondary campiness. It wasn’t until the Modern Era that this disappeared. The movie that truly demarcates the beginning of the modern era — the first to show that you could be successful with a completely serious take that was both big and smart, and also stylish — was Bryan Singer’s X-Men in the year 2000. There’s a good reason for that date: it was just after The Matrix completely changed everyone’s perception of how to make an action movie, just as Star Wars had done a generation earlier. But Blade feels completely modern, even though it came out the year before The Matrix. I do believe it qualifies as the true first of the Modern period. About the only precedent for it in theaters was Dark City, which was an obvious influential predecessor to The Matrix, but could hardly have influenced Blade much, as this film began shooting a year before Dark City came out.